What did you think of The Village? M. Night Shyamalan is a genius. He proved he could scare audiences with The Sixth Sense. He proved he could cross genres with Unbreakable. He proved he could write a complex, yet meaningful story with Signs. The Village, however, completely blew me away. Due to his reputation as a masterful story-teller and the king of the twist ending, audiences entered the theater assuming The Village would have a similar twist as his previous films. 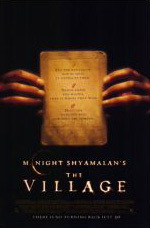 Lucky for audiences, and for M. Night as well, the twist in The Village is his most amazing yet. Unfortunately, I can’t reveal just how amazing the twist is, without giving away most of the magic of the film. I can tell you about the amazing actors, and the incredible world M. Night created. The story of the film revolves around a village in the late 1800s. It’s a close-knit community where friends are family, and the folklore runs deep. The village is surrounded by thick woods, and in those woods live horrible creatures. The villagers and the creatures have an unspoken pact, where the villagers don’t enter the woods and the creatures don’t enter the village. When that changes, and the creatures become threatening, the very existence of the village is at stake. It takes two brave young villagers to take a stand for justice and love. The film’s leading man is Lucius Hunt, played by Joaquin Phoenix, who is an incredible actor. I would go see any movie he is in, because he brings his characters to life. Granted, the part of Lucius Hunt was written specifically for him, but Joaquin makes the character completely his own. Lucius (which, by the way, is an incredibly cool name) is a strong-willed young man who stands up for what he believes in. At the same time, he’s very quiet and reserved. Just the opposite, Ivy Walker, played by the incredible and incredibly beautiful Bryce Dallas Howard, is outspoken and confident, if sometimes a little abrupt. The other characters in the film are equally well-written and well-acted. Sigourney Weaver plays Alice Hunt, Lucius’ mother. She’s a little stiff when it comes to the old-style language, but she is forgiven because she’s Sigourney Weaver. Adrien Brody plays the mentally-challenged Noah Percy, and plays him eerily well. Cherry Jones, who played the policewoman in Signs, has a minor part in this film but is excellent nonetheless. Judy Greer plays Ivy Walker’s sister Kitty, and has possibly the most amazing crying scene in any movie ever. M. Night himself even has a brief, wonderfully filmed, cameo (as he usually does in his own films). Although the entire cast is wonderful, Bryce Dallas Howard is the shining star of the film. She’s beautiful and talented and even has a pretty singing voice. I hope she wins an Oscar or Golden Globe or whatever for this film, and gets cast in many, many more. The quality of the acting and cinemetography are nothing short of fantastic, as you would expect from an M. Night Shyamalan-directed movie. His writing for this film surpasses all his previous work, and that’s a big statement coming from someone who lists Signs as one of their all-time TopFive favorite movies. M. Night created a story within a story. He created a twist, to rival all his previous twists. I honestly don’t know how he can follow this up, but I’m definitely looking forward to finding out.